“Caesar Must Die” but He Will Win the Golden Bear! There are proud moments and then there are proudest moments! The recent win by the Taviani brothers in Berlin can be counted among the latter. Amidst stories of negligent Italian sailors and the economy of my beloved homeland gone south, this is a greatly welcomed bit of good news. The beginning of some momentous Renaissance for Italian cinema. A recent article in an Italian publication mentioned the lack of cinematic culture in my modern-day countrymen (and women). It’s a sad time for a land that can boast the talents of masters like Fellini, Visconti, Rosi and De Sica, on whose films the entire world has drawn inspiration. Yet the numbers for new films, foreign imports and for movies in general (unless you count Titanic and equally simplistic American flicks) in Italy is abysmal. An eighth of the attendance numbers in France, where there are roughly the same number of inhabitants. So, the fratelli Taviani, with this ode to Shakespeare, but also a tribute to those we would rather forget, behind the bars of various jails around the world instead of rehabilitating, are winners all around. And you can quote me on this, the film is going all the way to the Oscars next year. Oh, dare I say it? Why not… And it will win too! See, you just can’t lose with the Bard these days, he taps into every contemporary nerve, and I’m not just saying that because I’m my grandfather’s (Hans Rothe) granddaughter! 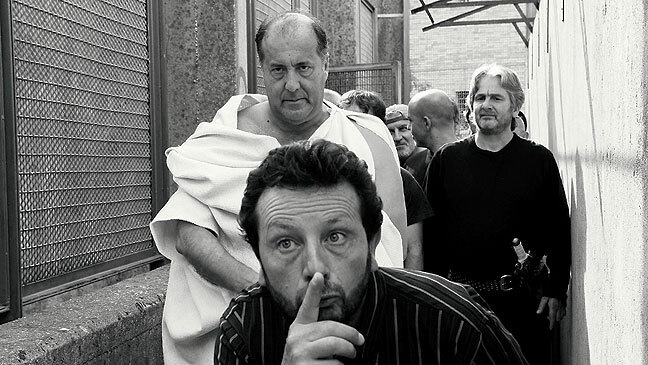 Caesar Must Die (Cesare Deve Morire) is distributed in Italy by Sacher Distribuzione, the company founded by another personal favorite filmmaker Nanni Moretti. It has picked up nearly worldwide distribution at the Berlinale, even before receiving the Golden Bear, so expect it soon in a theater near you. This entry was posted on Sunday, February 19th, 2012 at 2:58 pm and is filed under Films 2 See, Trailers - @ 1st Impression?.